Just A Car Geek: 1983 Peugeot 505 SR - Euro-spec Peugeot in The U.S.
1983 Peugeot 505 SR - Euro-spec Peugeot in The U.S.
You had to suspect that Peugeot was in trouble in North America when the 505 didn't become runaway best seller. 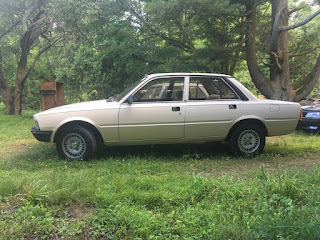 Introduced in 1980, just as Americans were starting to buy every European near-luxury sedan we were offered, the 505 was the right size for the time and came in a dizzying amount of sub-models ("GL", "S", "GLS", "STI", "DL", "Liberté", "STX", "Turbo", "GLX", "SW8", "V6", "Turbo S"). The body, designed by Pininfarina and Peugeot, was conservative, but stylish. The interior, designed by Paul Bracq, who had worked with Mercedes and BMW, was well laid out, with just enough French quirkiness to remind you that you weren't driving a Mercedes or BMW. Engine options in North America ranged from a 2.0 N/A I4, a diesel, a turbo I4 and a V6. Whether you wanted economy or performance (and in the 1980s it was rare to get both at the same time), Peugeot had you covered. Where the Peugeot (and French cars in general) really shined was in its ride / handling characteristics. It had the ride and comfort of a big American car, but could hang with its European competition in the twisties. 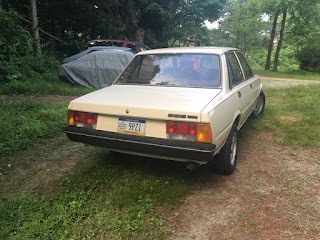 I owned a few 505s over the years, along with many other European sedans, and never had a car that rode and handled quite as well as the 505 did. But, as good as they were, we didn't buy them. Peugeot's best year in North America was 1984 when it sold just over 20,000 cars. To put that in perspective, BMW, Audi and Mercedes each sold over 3 times as many cars in the US. Even Saab came close to doubling Puegeot's sales. So why didn't Peugeot sell many cars here? A minuscule dealer network didn't help. Most dealers were on the east and west coasts with many states in between having none. The reputation of French cars in the US was not great, but that was mostly because of the Renault Dauphine debacle 25 years earlier. I really have no idea why they didn't sell. But they didn't. Peugeot finally got sick of trying and, after introducing the modern 405 here, left the US market in 1991. This is really interesting 505. The "SR" was never sold in the US. I'm not 100% sure what the "SR" trim package includes. It looks to be a mid-range model, with power windows and cloth seats. 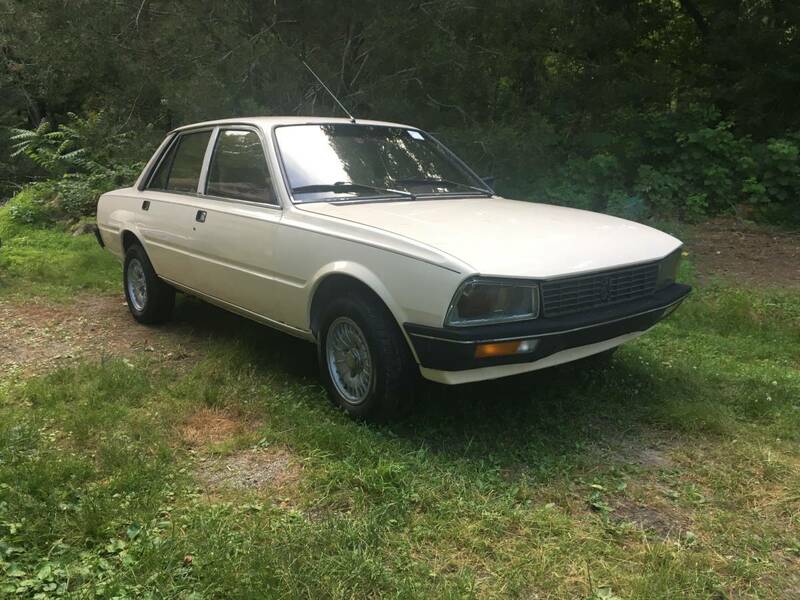 It has Peugeot's 2.0 liter 4 in it, but has a carburetor instead of fuel injection. It has a manual transmission. Best of all, it has the European headlights and bumpers. 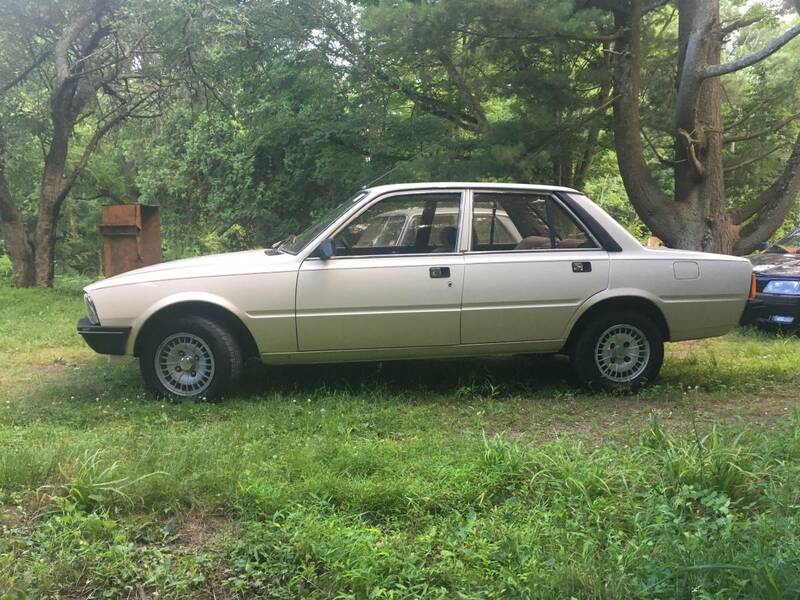 This car is not perfect, but in overall decent condition. According to the seller the body has some "some chips and bubbling in paint." He says that there is "some surface rust & no holes." The interior looks very nice. This car needs tires, which is no big deal. But it also needs a carburetor, which is more of a big deal as the car won't stay running right now. It is most likely a Solex carb. There might be a few people still alive who will know how to rebuild it, but they are going to be few and far between. If you can't find someone to rebuild it there should be plenty new / rebuilt ones available overseas. Finding a new one in the US is probably close to impossible. On the road the 505 won't get much attention. Most people have no idea what it is and its understated styling doesn't scream "look at me!" But, show up at a car show in a Euro spec 505 and you'll get all attention you'll ever want from those in the know. It's really cool to see this car still alive and in the U.S.
Those headlights and bumpers give it such a menacing, sinister look. I love the transfomation. I bet it's pretty great to drive. 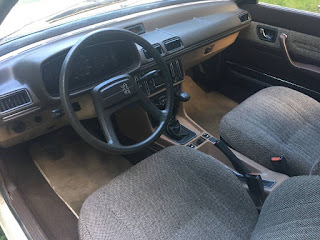 I had a 1986 505 turbo, it was a great car! Best seats ever!